Gårdvarens Zamma Wisa got Excellent 1 CQ 1 best female CACIB BOB and got the title SE W-2019 this was also her last CACIB for the international C.I.E title. X-ray results of Hexen House Illusionh hips A and elbows 0, Hexen House Llevenh hips B and elbows 0. Puppyshow in Gävle, Hexen House Millionh 1 HP BOB BOG-1 puppy ! Hexen House Millionh won the competition puppy of the year at our local kennel club !!! Hopefully there will be puppies around march 6 and march 22. Odor recognition in Nosework at Gävle BK. Hexen House Justifyh is in heat and the trip will go to Netherlands in a few days. Hexen House Hedrah is in heat and the trip will go to Netherlands in the beginning of January. Obedience competition at Gävle BK in Start Class x 4, Hexen House Justify and Monah got 164 p and 174,5 p on saturday and the title LD Start Class. 150 p and 154,5 p on sunday. Nordic Show Stockholm, Hexen House Crohn Excellent 1 champion class, Hexen House Beliefh Excellent 1 CQ working class 1 best female R-Nordic CAC, Hexen House Joinh Excellent 2 CQ open class, Hexen House Believeh Excellent 1 CQ veteran class 1 best female Nordic CAC BOB veteran BOB and got the titles SE VW-18 SE W-18. Sad news today, no puppies this time for our hovawart. We will try again. Obedience competition in beginners class at Gävle BK, Hexen House Justifyh and Monah got 175 points and approved for the next class. They also won the competition ! Obedience competition in beginners class at Gävle BK, Hexen House Justifyh and Monah got 175,5 points and approved for the next class. Need 3 approved for the title in beginners class. Hexen House Hedrah and Monah started in open class bloodtracking today and got a first prize and she also became Swedish Bloodtracking Champion !!! Hexen House Hedrah and Monah started in open class bloodtracking today and got a first prize, the second one. Exteriordescription today at Gävle BK Hexen House Hedrah was approved. Today our Hovawart Gårdvarens Zamma Wisa was mated with the austrian male "Lenny" so now we keep our fingers crossed for puppies. Hexen House Hedrah and Monah competed and got 228 points and are now approved for lower class tracking, we also won the competition! Hexen House Inspirathion and Marie also got approved for lower class ! Nosework 1 competition in Gällivare, Hexen House Jugah got 75/100 points today. Hexen House Hedrah and Monah started in open class bloodtracking today and got a first prize. Hexen House Hedrah and Monah started in abilitytest bloodtracking today and she got approved. Beginners class tracking at Eskilstuna BK, Hexen House Krypthon and Annelie got 202,75 points and approved for lower class. Obediencecompetition in class 1 at Nossebro BK, Hexen House Hrespect and Siw gor 260 points and a first prize. Hexen House Believeh Excellent 1 CQ 1 best female CAC BOB and BOB veteran. Nosework 1 competition in Luleå, Hexen House Jugah got 100/100 points today and a diploma. Rallyobedience competition in beginners class today at Töreboda BK, Hexen House Hrespct and Siw got 75 and 85 points in the two rounds and approved results. Only one more for the beginners title. Tracking competition at Skutskärs BK today Hexen House Justifyh and Monah competed in lower class and we gor 432 points and are now approved for higher class tracking, we also was #3 on the podium. Happy Birthday to our Hovawart "Tirah" on her 4 birthday today. Tracking competition at Gävle BK today Hexen House Justifyh and Monah competed in lower class and got 409 points and approved. Nosework 1 competition in Kiruna, Hexen House Jugah got 100/100 points today and a diploma. Hexen House Jugah was approved in odor recognition at NW 2 today. Hexen House Believeh Excellent 1 CQ 1 best female BOS BOB veteran BIS-4 veteran ! National show in Askersund, Hexen House Erahn VG2 open class Hexen House Beliefh Excellent 1 CQ 2 best female CAC. Hexen House Beliefh Excellent 1 CQ CAC 1 best fmale CACIB BOS. Exteriordescription today at Gävle BK Hexen House Justifyh was approved. Happy Birthday to our Z litter today on their 10 birthday !! Happy Birthday to our J litter today on their 2 birthday !! Tracking competition in beginners class at Gävle BK, Hexen House Justifyh and Monah got 186,5 points and are now approved for lower class. We also was #3 at the podium. National show at Gävle BK today, a great warm day with a lot of friends that helped during the day. Hexen House Lothon 1 HP BOB puppy BIS-1 puppy !! Chatmar Iceman excellent 1 working classCQ CAC Swedish Show Champion !! Hexen House Crohn excellent 1 champion class CQ 1 best male BOS BIS-2 working !! Hexen House Kristallh excellent 1 junior class CQ BIS-3 junior !! Hexen House Believeh excellent 1 veteran class 4 best female BIS-2 veteran !! Hexen House breedersgroup 1 HP BIS-1 breedersgroup !! Nosework 1 competition in Luleå, Hexen House Jugah got 25/100 points today. Nosework 1 competition in Luleå, Hexen House Jugah got 50/100 points today. Hexen House Dhracc and Hexen House Dezireh got their Swedish Wildtracking Titles today !! Big congratulations to Ingela. Obedience competition in beginners class at Heby BK, Hexen House Krypthon and Annelie got 181 points and approved for the next class and got the title LD Startklass. Tracking competition in lower class at Söderhamns BK, Chatmar Iceman and Monah got 439,75 points and are now approved for higher class. We also was #2 at the podium. National show at Roslagens BK today, Chatmar Iceman excellent 1 CQ 1 best male CAC BOB BIS-1 working, Hexen House Hedrah excellent 1 open class, Hexen House Llevenh 1 HP BOB puppy BIS-2 puppy. Obedience competition in beginners class at Surahammar BK, Hexen House Krypthon and Annelie got 185,5 points and approved for the next class. Obedience competition in beginners class at Surahammar BK, Hexen House Krypthon and Annelie got 169,5 points and approved for the next class. Obedience competition in beginners class at Surahammar BK, Hexen House Krypthon and Annelie got 159 points and approved. Nordic show in Gimo today, Chatmar Iceman excellent 1 CQ 1 best male CAC Nordic CAC BOB, Hexen House Justifyh excellent 1 CQ 1 best female Nordic CAC BOS. Hexen House Jugah was approved in odor recognition at NW 1 today. Hexen House Valkyriah & Hexen House Smeagol has walked over the rainbow bridge, they will be deeply missed by all of us and forever in our hearts. Happy Birthday to our C-litter on their 6 birthday today ! Rallyobedience competition at Gävle BK today, in graduate class Hexen House Justifyh got 97 points, Hexen House Hedrah got 97 and 96 points, Chatmar Iceman got 80 and 87 points, Gårdvarens Samma Wisa got 97 points and the title RLD F ! Rallyobedience competition at Gävle BK today, in beginners class Hexen House Justifyh got 81 and 98 points and the title RLD N ! Hexen House Hrespect has competed in NW 1 clear round and completed all 4 rounds. Hexen House Hrisk has competed in SC2 tracking and he got 92/100 points. Hexen House M-litter has arrived today, 4 boys and 3 girls. Happy Birthday to our B-litter on their 8 birthday today ! Today at Knivsta BK Chatmar Iceman and Monah competed in lower class tracking, we got approved results so now he can compete for the CAC in th showring. Only one week between the first and second rallyobedience champion, Ingela did it again this time with Hexen House Dhracc. Big big Congratulations !! X-ray result for Hexen House Hrisk hips A/A. We got our first rallyobedience champion today, Huge congratulations to Ingela with Hexen House Dezireh !! X-ray result for Hexen House Frohzt hips A/A. Rallyobedience competition at Gävle BK, noviceclass Hexen House Justifyh got 100 points and #1 !! graduateclass Chatmar Iceman "Storm" got 98 points and #3, Gårdvarens Zamma Wisa got 96 points. graduateclass Chatmar Iceman "Storm" got 93 points and #3, Gårdvarens Zamma Wisa got 90 points. Happy Birthday to HH Smeagol on his 14 birthday today ! Happy Birthday to our D-litter on their 5 birthday today ! Happy Birthday to our G-litter on their 3 birthday today ! Happy Birthday to our A-litter on their 8 birthday today ! High Clearings Kingston and Hexen House Believehs puppies Lothon & Llevenh are now 3 weeks old. Happy Birthday to our I-litter on their 2 birthday today ! Happy Birthday to our X-litter on their 10 birthday today ! Happy Birthday to our H-litter on their 2 birthday today ! Rallyobediance competition at Gävle BK in graduateclass for me (Monah) and Chatmas Iceman "Storm", we got 99 points and was #1 !! He also earned the RLD F title. Rallyobediance competition at Gävle BK in graduateclass for me (Monah) and Chatmas Iceman "Storm", we got 84 points and was #6. Happy seventh birthday to our Chatmar Ghost From The Past today. Hexen House Believeh is confirmed pregnant today by ultrasound, so puppies in the end of january. Swedish Winner Show in Stockholm, Hexen House Crohn VG1, Hexen House Erahn G, Hexen House Beliefh VG2, Hexen House Justifyh Excellent 1 Swedish Junior Winner 2017, Hexen House Believeh Excellent 1 CQ CACIB BOS Swedish Winner 2017. Bloodtracking open class for the third time with Hexen House Justifyh and Chatmar Ice Witch, they booth got a first price and Justifyh also got HP. Booth got their swedish wildtracking champion title. Bloodtracking open class today with Hexen House Justifyh and Chatmar Ice Witch, they booth got a first price again. Bloodtracking open class today with Hexen House Justifyh and Chatmar Ice Witch, they booth got a first price. Bloodtracking abilitytest today with Hexen House Justifyh and Chatmar Ice Witch, they did excellent and was approved. Hexen House Jugah and Hexen House Joinh is x-rayed with HD A/A and ED 0/0. Hexen House Believeh is now mated with High Clearings Kingston. Odor recognition today in Nose Work I with Gårdvarens Zamma Wisa, in Nose Work II with Hexen House Crohn, Hexen House Feahr and Chatmar Iceman. All 4 was approved !! Happy birthday to our F-litter on their 4 birthday today !! Today Hexen House Bahrzk went over the rainbow bridge, he will leave a big print in our hearts and of course also deeply missed and never forgotten. Bloodtracking abilitytest november 13 with Gårdvarens Zamma Wisa, she was approved. Then open class bloodtracking on november 14, 17, 18 all with first price and got the title SE VCH Swedish wildtracking champion. Mentaldescription at Gävle BK today, Hexen House Erahn, Hexen House Inspirathion, Hexen House Hedrah and Chatmar Ice Witch all completed and secure to gunshot. Bloodtracking in open class again today in Årsunda, Chatmar Iceman got his last first price and became Swedish Wildtracking Champion SE VCH. Bloodtracking in open class today in Ockelbo, Hexen House Feahr got a first price and HP he also got the champion title SE VCH, Chatmar Iceman also got a first price. Bloodtracking in open class again today in Årsunda, Hexen House Feahr got a first price and HP, Chatmar Iceman got a first price too. Obedience competition beginners class at Valbo BK, Monah and Chatmar Iceman got 160,5 points a first price and was number 3 in the competition. He also got the title LD Startklass. Hexen House Givenh will be mated next year with our import Chatmar Iceman. Bloodtracking today in open class in Ockelbo, Hexen House Feahr got a first price, Chatmar Iceman got a second price. Rallyobedience competition at Gävle BK, novice class x 3 with Gårdvarens Zamma Wisa, we got 87, 90 & 95 points so she got her title RLD N, Hexen House Hedrah also in novice class, we got 72, 78 & 82 points so she also got her title RLD N. Hexen House Believe in graduate class, we got 69, 89 & 96 points and she got her title RLD F, Chatmar Iceman also in graduate class, we got 1 round disqualified (I was lost and did go the wrong way) and 72 & 96 points in the other two. Believeh and Storm was booth on top of the podium with 96 points in the same round. Tracking competition beginners class at Gävle BK, Monah and Gårdvarens Zamma Wisa competed but had a bit of bad luck so not approved this time. Mentaltest today at Gävle BK, Hexen House Feahr passed with 529 points and got the title KORAD. Today at Gävle BK exterior description and mentaltest, Gårdvarens Zamma Wisa, Chatmar Ice Witch and Chatmar Iceman did their exterior and all of them passed and are approved. Chatmar Iceman "Storm" also did his mentaltest and passed with 503 points and got the title KORAD. X-ray results for Hexen House Hrespect HD B/B and ED 0/0. X-ray results for Hexen House Givenh HD A/A and ED 0/0. Bloodtracking abilitytest, Hexen Hous Feahr & Chatmar Iceman was approved. Happy birthday to our V-litter on their 12 birthday today !! Happy first birthday to our J-litter today !! Rallyobedience competition at Falu BK Monah and "Storm" (Chatmar Iceman) started in 2 rounds in the noviceclass, first round 79 points and qualified result, second round 100 points and won the competition. He got his first title RLD N !! Hexen House Crohn excellent 1 CQ BOB BOG-1 BIS-1 working BIS-1,Chatmar Iceman excellent 1 CQ 2 best male, Hexen House Feahr excellent 1 CQ 3 best male, Hexen House Inspirathion excellent 1 CQ 4 best male BOB-junior BIS-1 junior, Hexen House Erahn excellent 2 CQ open class, Hexen House Justifyh excellent 1 CQ 2 best female, Hexen House Hedrah excellent 1 CQ 3 best female, Chatmar Ice Witch excellent 1 open class, Hexen House Beliefh excellent 2 open class, Hexen House Believeh excellent 1 CQ BOS, Hexen House breedersgroup 1 HP BIS-1, Gårdvarens Zamma Wisa excellent 1 CQ BOB BOG-1 BIS-2. Hexen House K-litter is born, 4 males and 2 females out of Hexen House Feahr and Hexen House Awynh. Rallyobedience competition at Gävle BK Monah and Chatmar Iceman started in 2 rounds in the noviceclass, first round 91 points and a second place. Second round 99 points and won the competition, just one more for the title in noviceclass. Tracking competition at Gävle BK Monah and Chatmar Iceman got 207 points in beginnersclass a fourth place and approved for lowerclass. Happy birthday to our Y-litter on their ninth birthday. Obedience competition at Bollnäs BK Monah and Chatmar Iceman got 181,5 points and won the competition and also approved for class 1, just one more for the title in startclass. Mentaldescription today at Borlänge BK, Hexen House Ghast got approved and secure to gunshoot. Hexen House Crohn excellent 1 CQ BOB, Hexen House Justifyh excellent 2 juniorclass, Hexen House Hedrah excellent 1 CQ BOS, Gårdvarens Zamma Wisa excellent 1 CQ BOB. Mentaldescription today at Gävle BK, Chatmar Iceman "Storm" and Gårdvarens Zamma Wisa booth got approved and secure to gunshoot. Hexen House Hrespect with owner Siw competed in startclass obedience at Mariestads BK, they got 177 points and a first price. Obedience competition at Edsbyns BK Monah and Chatmar Iceman got 141,5 points a third place and approved. International show in Gimo, Chatmar Iceman excellent 1 openclass, Hexen House Justify excellent 1 CQ BOB. Happy birthday to our C-litter on their fifth birthday. International show Hässleholm excellent 2 junior class. Obedience competition at Ockelbo BK Monah and Chatmar Iceman got 171,5 points a fourth place and approved for class 1. Hip x-ray of Hexen House Icohnic was graded excellent in Australia. National show at Kristianstads BK Hexen House Joinh excellent 1 CQ BOB. Happy birthday to our B-litter on their seventh birthday. Hexen House Awynh is now mated with our lovely Hexen House Feahr so puppies is expected around midsummer. Hexen House Enduhr was awarded his last CAC today at the kennelclub show in Västerås so now he can put the SE UCH (swedish showchampion) title before his name. Happy birthday to our E-litter on their fourth birthday. Hexen House Feahr got puppies at Kennel Flisdaelen's in Sweden, 3+0 terv and 1+4 groen. Hexen House Awynh is in heat and will be mated with our lovely Hexen House Feahr in the near future. Hexen House Justifyh 1 HP BOB puppy BOG-4. Hexen House Hrisk and Corinne did a nosework exam today they got 79 out of 100 points. Great job! Hexen House Hrisk best youth dog at the BHCN show. Hexen House Hrespect with owner Siw got approved odore recognition NW 1 today. X-ray results for Hexen House Infinityh HD A/A ED 0/0. Chatmar Iceman aka "Storm" got approved odore recognition NW 1 today. Happy birthday to our D-litter on their fourth birthday. Happy birthday to our G-litter on their second birthday. X-ray results for Hexen House Inspirathion HD A/A ED 0/0. Happy birthday to our A-litter on their seventh birthday. Hexen House Justifyh 1 HP BOB puppy. Happy birthday to our I-litter on their first birthday. Gårdvarens Zamma Wisa Excellent 1 CQ 1 best female CAC CACIB BOS and Danish Champion!! Hexen House Crohn Excellent 1 CQ 1 best male CAC CACIB BOB and Danish Champion!! Happy birthday to our X-litter on their 9 birthday. X-ray results for Hexen House Hedrah HD A/A ED 0/0. Happy birthday to our minipin Jean Dark Whiskey on his 9 birthday. Happy birthday to our H-litter on their first birthday. Hexen House Believeh Excellent 1 CQ 1 best female CAC BOS Norwegian champion & Danish champion !!!!! X-ray results for our hovawart Gårdvarens Zamma Wisa HD A/A ED 0/0. 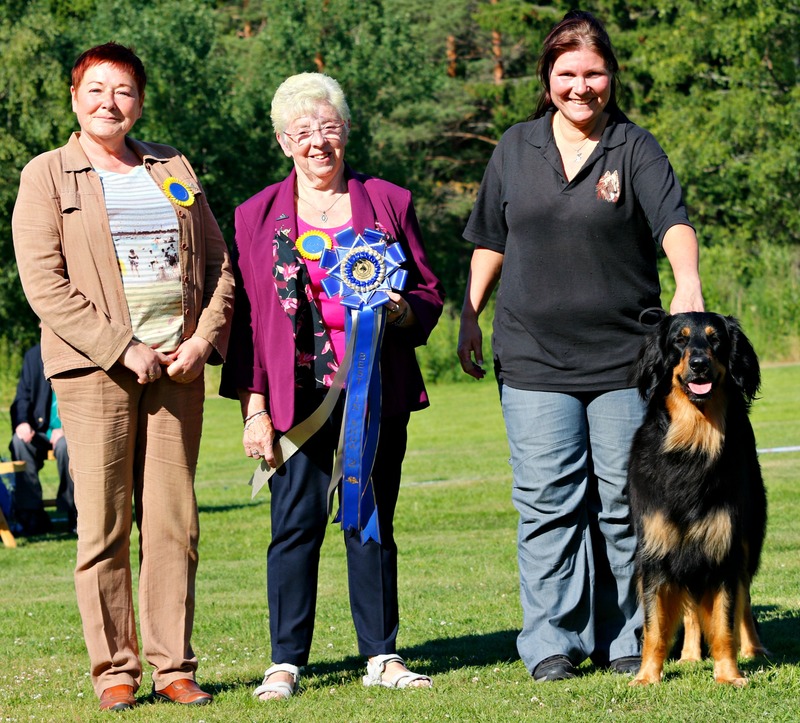 Gårdvarens Zamma Wisa Excellent 1 CQ 1 best female CACIB BOS and Crufts qualified. Gårdvarens Zamma Wisa Excellent 1 CQ 2 best female CACIB. Hexen House Believeh excellent 1 CQ 1 best female CACIB BOB and Crufts qualified. X-ray results for Hexen House Ganduhr HD A/A ED 0/0. Happy birthday to our F-litter on their 3 birthday. Hexen House Crohn, Hexen House Feahr and Chatmar Iceman all got approved. Hexen House Inspirathion 1 HP BOB-puppy BOG-1 BIS-1 !!!!!! Carina and Hexen House Dezireh has competed obediance class III today and the got 280 points second place and the title LP III !!! Gårdvarens Zamma Wisa excellent 1 CQ 1 best female CAC CACIB BOB Norwegian champion !!! Happy birthday to our W-litter on their 11 birthday. X-ray results for Hexen House Gryffindohr HD A/A. Hexen House Crohn excellent 1 CQ 1 best male CAC CACIB BOB Finnish champion !!!! Hexen House Inspirathion 1 HP BOB puppy BOG-2 !! Mentaldescription today at Nacka BK, Heen House Givenh got approved and secure to gunshoot. Hexen House Icohnic 1 HP BOB puppy BOG-1 !! Happy birthday to our V-litter on their 11 birthday. Hexen House Icohnic 1 HP BOB puppy BIS-1 !! Hexen House Etiqueh excellent 1 CQ open class 1 best female BOS BIS-4 bos !! Hexen House breeders group 1 HP BIS-2 !! Hexen House Hedrah 1 HP BOB BIS-2 puppy 6-9 month !! Hexen House Crohn as got puppies at kennel Bazzakull 2+2 in Sweden, kennel Woodshines 3+2 in Norway and kennel Izagara 3+2 also in Norway. Hexen House Eldhrimm passed his exteriordescription so now he got the title KORAD. Hexen House breeders group puppies 1 HP BIS-1 !! Hexen House Crohn excellent 1 CQ champion class 1 best male BOB BOG-1 BIS-3 working BIS-1 !! Hexen Housse breeders group 1 HP BIS-2 !! Möklinta unofficial show Hexen House Icohnic 1 HP BOB puppy BOG-1 BIS-1 !! Hexen House Hedrah 1 HP BOS puppy. Hexen House Beliefh is pregnant and puppies will be expected around july 21. Happy birthday to our Y-litter on their 6 birthday. Unofficial show at Norrtälje BK, Hexen House Hedrah 1 HP BOB BOG-4 puppy at her first show. National show at Örebro BK, Hexen House Enduhr excellent 1 CQ workingclass 1 best male CAC BOB BIS-1 working. International show in Österbybruk, Chatmar Iceman excellent 1 in juniorclass, Hexen House Eldhrimm excellent 1 CQ openclass 1 best male CACIB BOS, Hexen House Faneyh excellent 2 openclass, Hexen House Beliefh excellent 1 CQ openclass 2 best female R-CACIB, Hexen House Dezireh excellent 1 CQ workingclass 1 best female CAC CACIB Swedish Champion!! BOB. Hexen House breeders group 1 HP. Happy birthday to Crohn & Cryh on their fourth birthday today. Hexen House Beliefh is mated to the beautiful male Diego De La Prairie De La Sommerau. So hopefully puppies will arrive in about 9 weeks. National show at Timrå BK, Chatmar Iceman excellent 1 in juniorclass, Hexen House Feahr excellent 1 CQ workingclass 2 best male, Hexen House Crohn excellent 1 CQ championclass BOB and BIS-1 working also BIS-4 all breeds. Hexen House Poehme excellent 1 veteranclass 13 years old. National show at Sundsvalls BK, Chatmar Iceman VG 1 in juniorclass, Hexen House Feahr excellent 1 CQ workingclass 2 best male, Hexen House Crohn excellent 1 CQ championclass BOB and BIS-4 working. X-ray results for Hexen House Ghast HD A/A ED 0/0. Happy birthday to our B-litter on their sixth birthday today. X-ray results for our imports Chatmar Iceman and Chatmar Ice Witch booth free on hips and elbows. Happy third birthday to our E-litter today. Hexen House Feahr got approved odor recognition test for NoseWork, so now he can compete in NoseWork 1. Happy first birthday to our imports Chatmar Iceman and Chatmar Ice Witch. Hexen House Crohn, Hexen House Dhracc and Hexen House Dezireh got approved odor recognition test for NoseWork, so now they can compete in NoseWork 1. Happy third birthday to our D-litter today. Happy birthday to our G-litter on their first birthday today. Happy sixth birthday to our A-litter today. I-litter is born today 5 males and 2 females. All puppies are spoken for. Happy eight birthday to our X-litter today. Happy eight birthday to our lovely minipin Jean Dark Whisky. H-litter is born today 4 males and 2 females. All puppies are spoken for. National show Letohallen Norway, Hexen House Feahr excellent 1 CQ working class 1 best male CAC BOS, Hexen House Beliefh excellent 1 CQ open class 2 best female CAC, Gårdvarens Zamma Wisa Excellent 1 CQ junior class 1 best female BOB. National show Letohallen Norway, Hexen House Feahr excellent 1 CQ working class 1 best male CAC BOS, Hexen House Beliefh excellent 1 CQ open class 1 best female CAC BOB, Gårdvarens Zamma Wisa Excellent 1 CQ junior class 1 best female BOB. Hexen House Dhracc HD x-ray result A/A !! Happy fifth birthday to our lovely Chatmar Ghost From The Past. My Dog Göteborg Hexen House Whyakin Excellent 1 CQ 2 best male BOB-veteran both days. Mating has taking place between Crohn and Awynh december 12-14 so puppies will be expected around february 13.
International show in Stockholm, Gårdvarens Zamma Wisa excellent 3 junior class. International show in Stockholm, Hexen House Feahr excellent 1 CQ working class CAC 4 best male and Champion!! Hexen House Crohn excellent 2 CQ champion class 3 best male R-CACIB, Hexen House Givenh excellent 2 junior class, Hexen House Faneyh vg 4 open class. Awynh is in heat and will be mated to our lovely Crohn in a few days. Mating has taking place between Ursus and Believeh november 25-27 so puppies will be expected around january 26. We have the opportunity to have one more litter out of Hexen House Awynh so she will hopefully be mated in december. Hexen House Believeh has a split heat this time so we have to wait and see when we go to the Netherlands. National show in Rättvik, Chatmar Iceman 1 HP BOB BIS-3 puppy, Chatmar Ice Witch 1 HP BOS puppy, Hexen House Feahr excellent 1 CQ BOB BIS-4 working BIS-4, Hexen House Faneyh excellent 1 CQ BOS BIS-2 intermediate, Hexen House Dezireh excellent 1 CQ 2 best female CAC, Gårdvarens Zamma Wisa excellent 2 juniorclass. 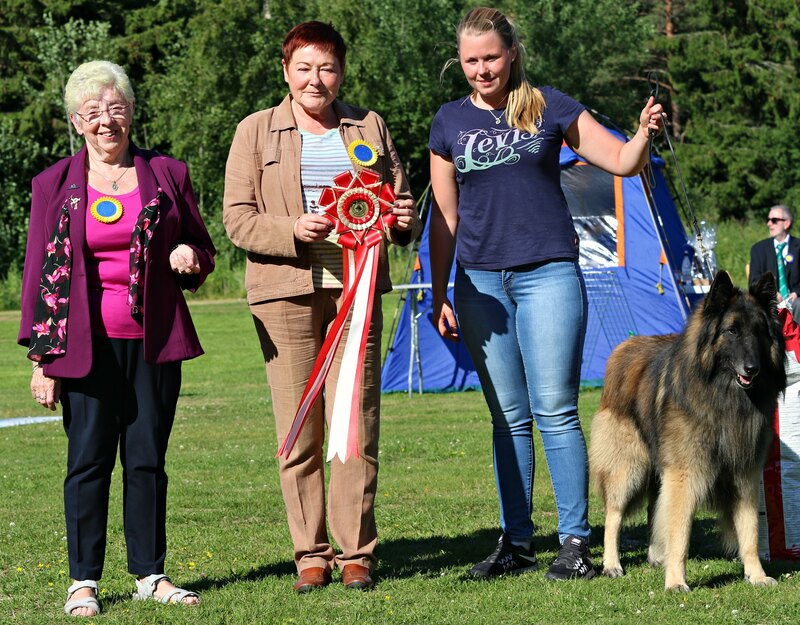 National show in Rättvik, Chatmar Iceman 1 HP BOB puppy, Chatmar Ice Witch 1 puppyclass, Hexen House Feahr VG 1 working class, Hexen House Faneyh excellent 1 CQ BOB BIS-1 intermediate BIS-3, Hexen House Dezireh excellent 1 CQ 3 best female CAC, Gårdvarens Zamma Wisa excellent 1 CQ 2 best female. Finally Hexen House Believeh is in season so next week our trip to Netherlands will start. Unofficial show at Gävle BK, Chatmar Iceman HP BOB BOG-2 puppy, Chatmar Ice Witch HP BOS puppy. Also Crohn was entered because it was the same judge thtat made him BIS-1 puppy at the same day he turned 4 month old and she said I really want to see what he will turn into when he grows up, he got HP BOB BOG-1 BIS-2 and she still loves him and think he's gorgeus. International Show Sundsvall, Hexen House Feahr excellent 1 CQ working class 2 best male CAC R-CACIB, Hexen House Crohn excellent 1 CQ champion class 1 best male CACIB BOB, Hexen House Faneyh excellent 1 CQ intermediate class 1 best female CACIB BOS. Now we will see how it works when a R-CACIB will turn into a CACIB because Crohn already have all of them so Feahr will have it. Obedience competition class II at Sandvikens BK, Monah and Hexen House Feahr got 162 points a first price and won the competition, he also got the title LP II. Rallyobedience competition graduate class at Falu BK, Carolin and Hexen House Fayahl got 1 qualifying round and the title RLD F, Monah and Hexen House Feahr got 2 qualifying rounds and also won one of the competitions at 96 points, he also got his RLD F title. Congratulations to our W-litter on their 10 birthday. International Show Eckerö, Åland Finland, Hexen House Feahr vg 1 working class, Hexen House Crohn excellent 2 champion class, Hexen House Faneyh excellent 1 CQ intermediate class 1 best female CAC CACIB BOS. Ingela and Hexen House Dhracc competed lowerclass tracking today at Hofors BK, they got 463,75 points a fourth place and are now approved for higher class. National Show at Ljusdals BK, Chatmar Iceman 1 HP BOB BIS-4 puppy, Chatmar Ice Witch 1 puppy class, Hexen House Feahr excellent 1 CQ working class 1 best male CAC BOS BIS-3 working. Pelle and Hexen House Enduhr competed lowerclass tracking today at Fagersta BK, they got 476,5 points a second place and are now approved for higher class. Rallyobedience competition at Gävle BK today, in graduate class Carolin and Hexen House Fayahl got 78 & 84 points and 2 qualifying rounds, Monah and Hexen House Feahr got 82 & 83 points and also get 2 qualifying rounds. International Show in Högbo Bruk, Hexen House Feahr excellent 1 CQ working class 2 best male CAC R-CACIB, Hexen House Crohn excellent 1 CQ champion class 1 best male CACIB BOS and the title C.I.B international champion !! Hexen House Dezireh excellent 1 working class, Hexen House Beliefh excellent 2 open class, Hexen House breeders group 1 HP. Monah and Hexen House Feahr competed obedience class II at Hedemora Säter BK, first start 173 points a first price and second place, in second start 166,5 points a first price and second place. Monah and Hexen House Feahr competed beginners class rallyobedience at Mora BK, first run 88 points and 6 place, second run 96 points and 4 place, he also got his title RLD N.
Sara has competed rallyobedience at Häverö BK today, in novice class with Hexen House Faneyh they got 99 points and second place, in graduate class with Hexen House Believeh, 95 points and first place. Also in graduate class with Hexen House Bahrzk, 91 points and second place. Hexen House Crohn has done his mentaltest today at Gävle BK, he got 432 points and passed. So now he got the title KORAD !! Unofficial show at Skutskärs BK, Chatmar Iceman 1 HP BOB BOG-3 puppy and Chatmar Ice Witch 1 puppy class. International show Gotland, Hexen House Whyakin excellent 1 CQ veteran class 1 best male BOB BOB-veteran. Monah and Hexen House Feahr competed beginners class rallyobedience at Järvsö BK, first run 66 points and 11 place, second run 97 points and 4 place. National show Gotland, Hexen House Whyakin excellent 1 CQ veteran class 1 best male BOS BOB-veteran. Monah and Hexen House Feahr competed lowerclass tracking today at Gävle BK, they got 522 points a third place and are now approved for higher class. Congratulations to our V-litter on their 10 birthday. Carina and Hexen House Dezireh competed lowerclass tracking today at Ockelbo BK, they got 459 points a fourth place and are now approved for higher class. International show Norrköping Hexen House Whyakin excellent 1 CQ veteranclass 1 best male BOS and BOS veteran. We got the answer from our appeal to the nordic panel about Hexen House Crohns hip x-ray, so now he's B/A and free !!!!!!!!!! Debut in the showring for our newest imports Chatmar Iceman and Chatmar Ice Witch, Iceman aka Storm got HP BOB and BOG-3 puppy, Witch was 1 in puppy class. Pelle and Hexen House Enduhr competed in obedience class III at Västerås BK they gor 258,5 points a first price and second place, they also got the title LP III !! Sara has competed in Swedish youth championship in rallyobedience. With Hexen House Believeh in novice class, they got the silvermedal ! With Hexen House Bahrzk in graduate class and they also got the silvermedal ! Congratulations to our Q-litter on their 12 birthday. Hexen House breedersgroup 1 HP BIS-1 !! Monah and Hexen House Feahr competed in obedience class I today at Skutskärs BK, they got 188 points a first price and fourth place, also got the title LP I.
Congratulations to our Z-litter on their seventh birthday. Monah and Hexen House Feahr competed in obedience class I today at Sala BK, they got 178,5 points a first price and third place. X-ray results Hexen House Faneyh HD A/A ED 0/0. National show at Gävle BK today and we had a fabulous day!! Hexen House Givenh 1 HP BOB puppy BIS-3 puppy !! Hexen House breedersgroup puppy 1 HP BIS-1 !! Hexen House Crohn excellent 1 CQ 1 best male BOB BOG-3 BIS-1 working !! And the hovawart Gårdvarens Zamma Wisa excellent 1 CQ 1 best female BOB BOG-1 BIS-1 !! Carolin and Hexen House Fayahl competed in beginnersclass rallyobedience at Gävle BK today and they got 94 and 96 points out of 100 and they also got the title RLD N ! Monah and Hexen House Feahr competed in obedience class I today at Gävle BK, they got 175 points a first price and second place. Monah and Hexen House Feahr competed in beginners class tracking at Olandstraktens BK today and they got 252 points and are now approved for lowerclass. Pelle and Hexen House Enduhr competed in obedience class III at Järvsö BK they gor 278,5 points a first price and won the competition. Hexen House Begohn needs a new home, see re home for more info. X-ray results Hexen House Dyarah HD A/A ED 0/0. National kennelclub show Avesta, Hexen House Crohn excellent 1 championclass CQ 1 best male BOB, Hexen House Believeh excellent 1 openclass CQ 2 best female. Carina & Hexen House Dezireh has competed in lowerclass tracking today at Heby BK, they got 421,75 points and fifth place they got a approved result and can now compete for the cac in the showring..
Specialshow Nacka BK, Hexen House Feahr excellent 1 CQ intermediateclass 4 best male BOS intermediate, Chatmar Ghost From The Past excellent 1 CQ workingclass, Hexen House Erahn excellent 2 openclass, Hexen House Enduhr excellent 3 openclass, Hexen House Crohn excellent 3 CQ championclass, Hexen House Faneyh excellent 1 CQ intermediateclass BOB intermediate 1 best female BOB BIS-1 intermediate BIS-1 !, Hexen House Beliefh excellent 3 CQ openclass 4 best female, Hexen House Believeh excellent openclass, Hexen House breedersgroup 1 HP BIS-1 ! Rallyobedience competitions at Avesta BK, Carolin and Hexen House Fayahl competed in beginnersclass they got 92 points and 7 place in booth competitions today. Mentaldescription att Gävle BK, Hexen House Feahr complete & secure to gunshot, Hexen House Fayahl complete & secure to gunshot, Hexen House Deziereh complete & waived gunshot. International show Österbrbruk, Hexen House Eldhrimm excellent 1 openclass CQ 1 best male CACIB BOS, Hexen House Crohn excellent 1 championclass CQ 2 best male R-CACIB, Hexen House Beliefh excellent 2 openclass CQ 3 best female R-CACIB, Hexen House Believeh excellent 1 openclass CQ 2 best female CACIB, Hexen House breedersgroup 1 HP. Congratulations to our C-litter on their third birthday. Stockholm youth district championship in obedience and rallyobedience, Sara competed with Hexen House Believeh in obedience class 2 and rallyobedience beginnersclass they won both competitions , Sara also competed with Hexen House Bahrzk in obedienceclass 3 and rallyobedience graduateclass and they also won both competitions !!! Show in Hässleholm, Hexen House Whyakin excellent 1 CQ veteranclass BOS and BOB-veteran. Specialshow Ivö, Hexen House Feahr excellent 1 CQ juniorclass 2 best male BIS-1 junior! Hexen House Erahn excellent 2 CQ openclass, Chatmar Ghost From The Past excellent 2 CQ workingclass, Hexen House Crohn excellent championclass, Hexen House Faneyh excellent 2 CQ youthclass, Hexen House Beliefh excellent openclass, Hexen House Believeh excellent openclass, Hexen House breedersgroup 2 HP. Obedience competition at Ockelbo BK, Monah and Crohn competed in class II, they got 171,5 points a first price and won the competition. Crohn also got the title LP II ! Unofficial show Gävle, Hexen House Faneyh BOB, Hexen House Erahn BOS, Gårdvarens Zamma Wisa BOB puppy BOG 3. Obedience competition at Valbo BK, Ingela competed with Hexen House Dhracc in class II, they got 146 points a second price and second place. Obedience competition at Bro-Håbo BK, Sara competed with Hexen House Bahrzk in class III, they got 2846,5 points a first price and won the competition. Obedience competition at Valbo BK, Ingela competed with Hexen House Dhracc in class II, they got 164,5 points a first price and third place. X-ray results Hexen House Feahr HD B/B ED 0/0, Hexen House Erahn HD B/B ED 0/0. Congratulations to our B-litter on their fifth birthday. Obedience competition at Hofors BK, Ingela competed with Hexen House Dhracc in class II, they got 165,5 points a first price and second place. Congratulations to our E-litter on their second birthday. Obedience competition at Haninge BK, Sara competed with Hexen House Bahrzk in class III, they got 256,5 points a first price and also the title LP III. Unofficial show Ludvika, Hexen House Faneyh BOB and BOG 4, Gårdvarens Zamma Wisa BOB puppy BOG 2. Rally obedience competition at Bro-Håbo BK, Sara competed with Hexen House Believeh in noviceclass they got 96 points in booth competitions and also got the title RLD N, with Hexen House Bahrzk in graduateclass she got 87 & 92 points and also got the title RLD F.
International Show in Kista Hexen House Feahr excellent 2 juniorclass, Hexen House Crohn excellent 1 CQ CAC 3 best male SE UCH NO UCH, Hexen House Whyakin excellent 1 CQ 4 best male SE VW-15 , Hexen House Beliefh excellent 3 openclass, Hexen House Believeh excellent 1 CQ 1 best female CACIB BOS SE W-15, Hexen House breedersgroup 1 HP. Congratulations to our S-litter on their 11 birthday. The Swedish breedclub competition The dog of the year 2014 in all different categories ended up very well for us this last year, we proudly present the results. Unofficial show Sollentuna, Hexen House Faneyh BOB and BOG 3, Gårdvarens Zamma Wisa BOB puppy BOG 4. Congratulations to our D-litter on their 2 birthday. Our G-litter has been born today 4+1 proud parents are Hexen House Begohn and Hexen House Awynh. Congratulations to our A-litter on their 5 birthday. Congratulations to Pelle and Hexen House Enduhr that got Västerås Workingclub best obedience dog of the year and also best workingdog in beginnersclass of the year. Congratulations to Sara and Hexen House Believeh that got the Stockholm South Workingclub best obedience dog of the year, she also was second with Hexen House Bahrzk. She also got best rallyobedience dog of the year with Hexen House Bahrzk. Congratulations to our X-litter on their 7 birthday. Congratulations to our Jean Dark Whiskey on his 7 birthday. Rally obedience competition in Rättvik, Shira and Hexen House Dezireh competed in advance class and they got 86 points, Ingela and Hexen House Dhracc competed in beginners class and they got 97 and 94 points and they also got their first title RLD N.
Congratulations to our P-litter on their 12 birthday. Rally obedience competition at apollogruppen, Sara and Hexen House Bahrzk competed in graduate class they got 100 points and won the competition. Obedience competition class II at Tierps BK, Monah and Hexen House Crohn got 159 points a second price and placed fourth. In class I Ingela competed with Hexen House Dhracc they got 151,5 points and a second price.